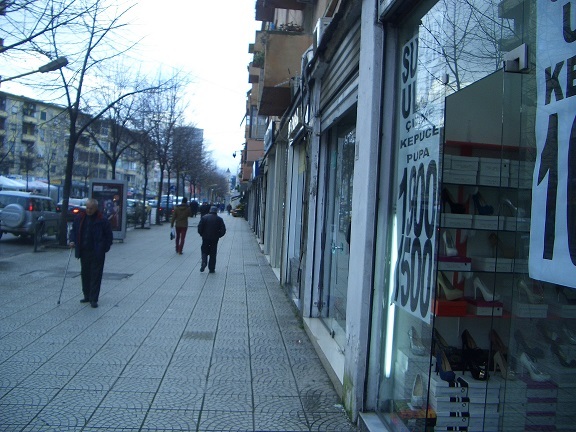 Prishtina is still a city in transition, recovering from a long period of conflict and the shift to a market economy. The population has increased fast after the war due to the influx of people from the countryside and refugees repatriated from other countries, and the presence of employees of international organisations. The increase of the demand for housing and offices led to what Vöckler (2008) calls “turbo-urbanism”, which means “unregulated construction, transgressing upon every standard I had been familiar with” (p.7). This construction was done through informal networks linking extended families, the diaspora, and local investors. The construction frenzy was not restricted by regulations by the emergent national governments and the transitory UN administration. 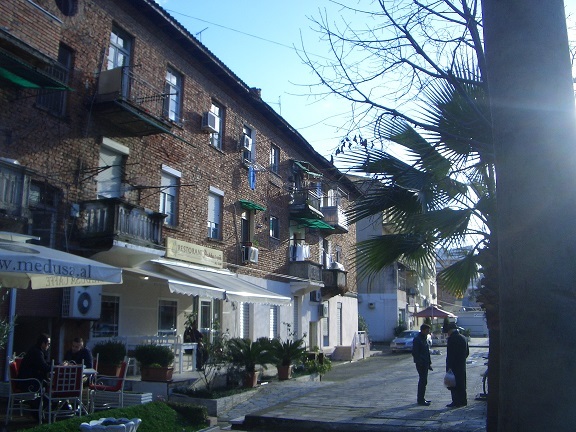 Properties were occupied because there was often no access to land registers, and architects and urban planners were not involved because there the planning documents from the Yugoslavian time were insufficient. In 2000, the director of the city planning agency was shot to death, after signing demolition orders for illegal buildings. The city soon became overbuilt, as investors tried to get as much usable space out of their lots as possible. This meant building up to the property boundaries and adding up floors until the money ran out. Additions were also made to the sides or top of existing buildings. As shown below, the urban landscape gained unique elements described as “maximum houses” and “houses on roofs”. Streets, public squares, and parks were not improved as this did not contribute to the investors’ profits. There was also a drastic reduction in the space for pedestrians, as the new and extended buildings used previously empty space and took over the pavements. In the old town, many old buildings were replaced by new high-rise buildings and streets were turned into narrow, one-way lanes, leaving no space for emergency lanes, accesses, parking, or street activity. Outside the old town, the ground floor of many buildings was also changed in order to create extra commercial space. Due to the scarcity of space, pedestrian pavements are now permanently filled with merchandise, cars, or both. 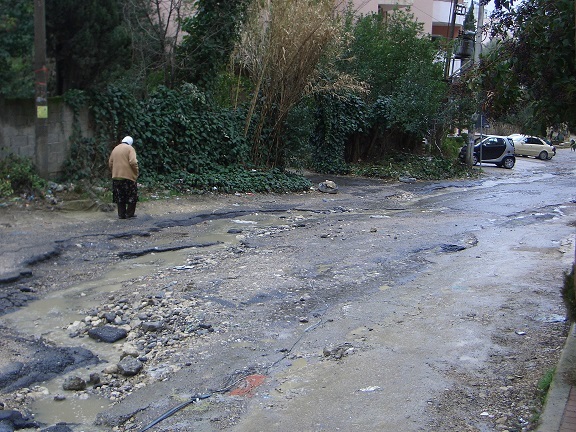 The never-ending construction activities add to these obstructions and contribute to the deterioration of streets and pavements. Further away, in the hills bordering the centre, gates and doors open directly onto the narrow streets and there is no provision for pedestrians, even in areas that are new or were radically changed. 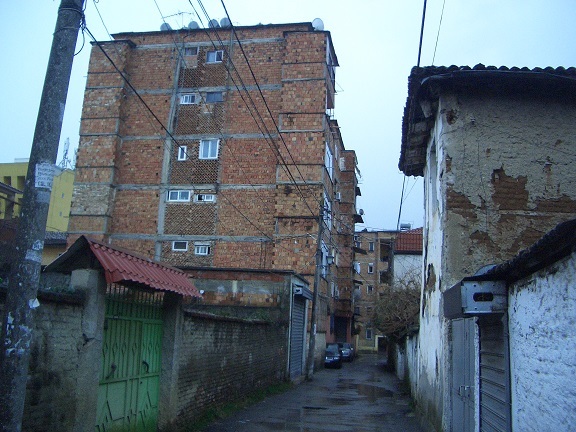 Elsewhere in Kosovo the situation is not much different, if not worse, as the case below in Ferizaj. According to Vöckler (2008), the solution for these problems requires re-thinking the dominant concept of comprehensive ‘master plans’ supported by public-private partnerships, because in the case of Pristina, almost every level of society was involved in illegal construction activities. Urban planning in post-conflict cities needs forms of cooperation that take into account the role of local social networks and economic patronage system. Vöckler, K., Archis Interventions (2008) Prishtina is Everywhere. Turbo Urbanism: the Aftermath of a Crisis. Archis, Amsterdam. Some of the most interesting work on the effects of busy roads on local communities is found in very old studies that now lay forgotten in the archives of national libraries and are not available online. The report of A. Lassière (1976) for the UK Department of the Environment is a good example. A shorter version appears in Lee and Tagg (1976). The hypothesis is that people adapt their perceptions about their neighbourhood and change their walking behaviour and social life as a response to the presence of motorways. This process is influenced by characteristics like age and length of residence in the affected area. 960 residents in five sites in London near motorways and in two control sites (near quiet roads) were asked to map their walking trips and social contacts, to identify the area they considered to be their neighbourhood, and to sort pack of cards with the name of local landmarks into three groups: those within their “personal neighbourhood”, those outside it, and those they did not know. 1) Size adjustment: area of the “personal neighbourhood”; number of points inside the neighbourhood; and number of points known. 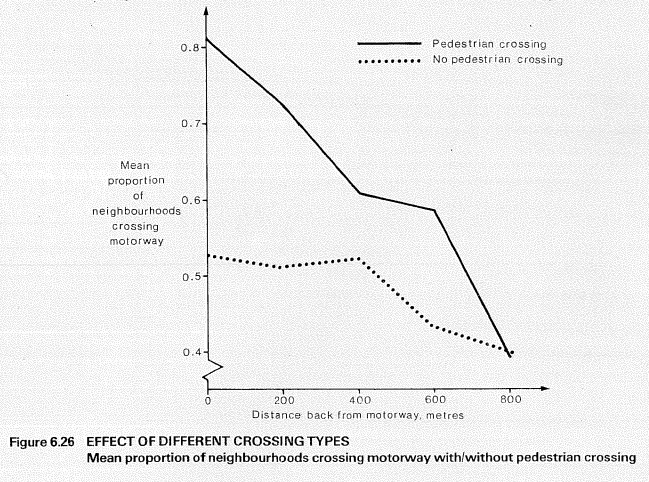 The analysis of these variables was disaggregated by distance from the main road, age of motorway, existence and distance to pedestrian crossings, and individual characteristics. In comparison, the famous study by Appleyard and Lintell in San Francisco looked only at some of variables in groups #3 and #4 and disaggregated results only by traffic levels. I will show only a small sample of the study’s 59 figures. 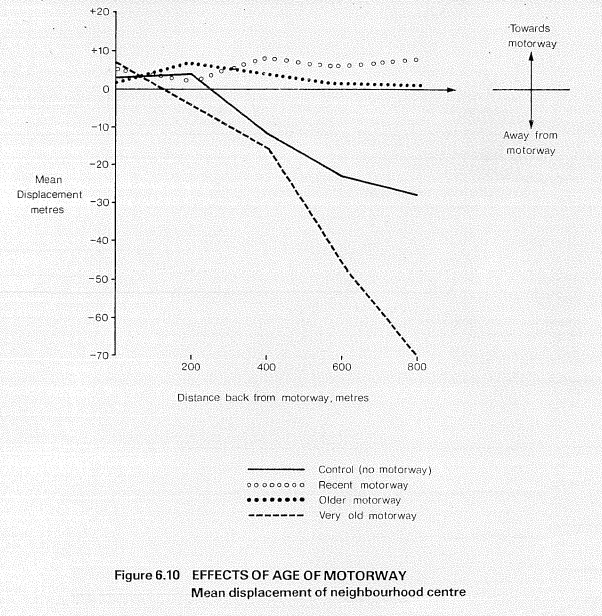 As expected, the presence of motorways leads to “bridging”, as evident in the figure below, which compares “personal neighbourhoods” near a motorway and in a control site. The “bridging” effect decreases with distance from the motorway and with the age of this motorway. The difference between sites near very old motorways and other sites is evidence even in locations 800m away from the road. 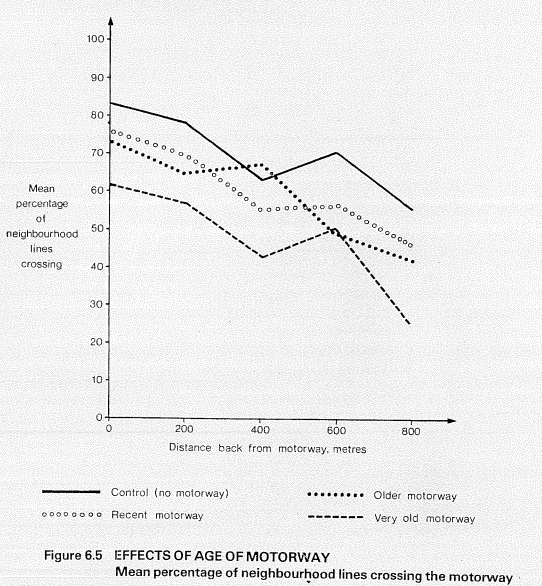 Other results reject the hypothesis that motorways disrupt local communities. For example, the charts below show no evidence of neighbourhood size adjustment (measured here by the number of points included in “personal neighbourhoods”) or displacement away from the motorway. Despite the mixed results, the study proposes a set of interesting indicators to assess the local effects of large roads. Lassière, A. 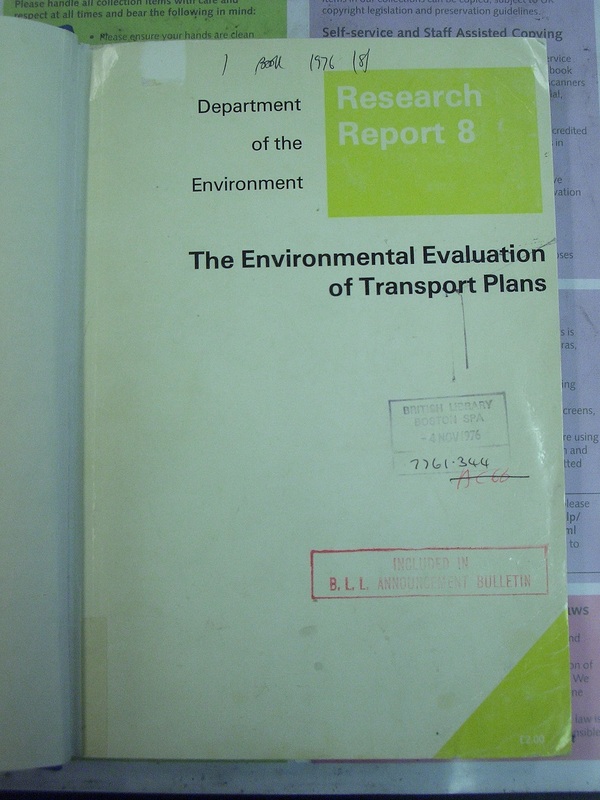 (1976) The Environmental Evaluation of Transport Plans. Report to the UK Department of Environment. 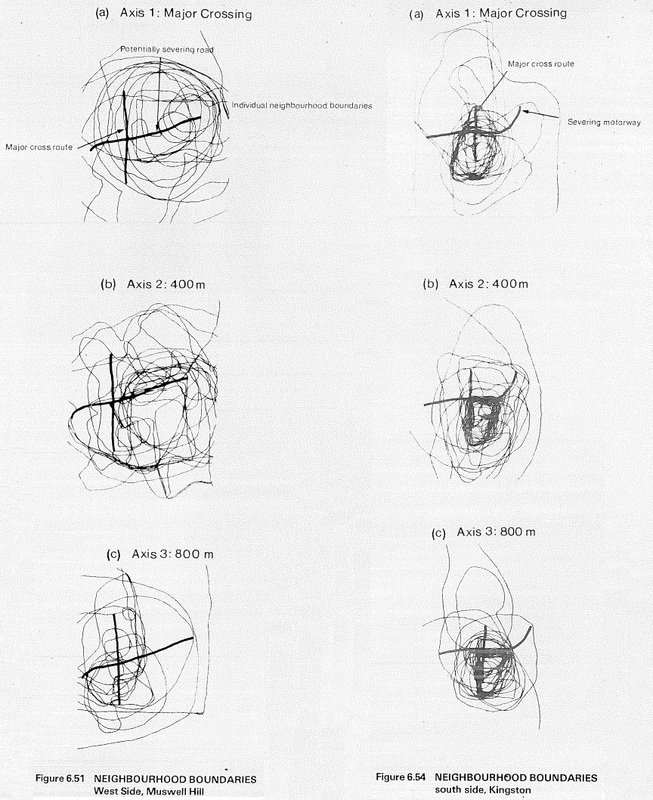 Lee, T., and Tagg, S. (1976) The social severance effects of major urban roads., in P. Stringer and H. Wenzel (Eds.) Transportation Planning for a Better Environment. Plenum Press, New York., pp. 267-281. 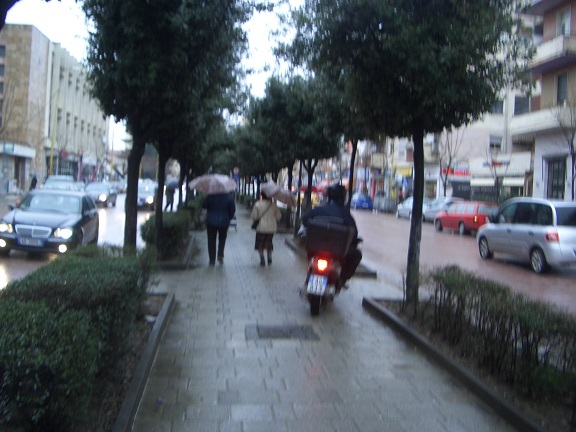 Tirana #5: What do we see when we walk? The quality of the walking experience does not depend only on what is beneath our feet but also on what we see with our eyes. It is more pleasant to walk where the landscape is beautiful. 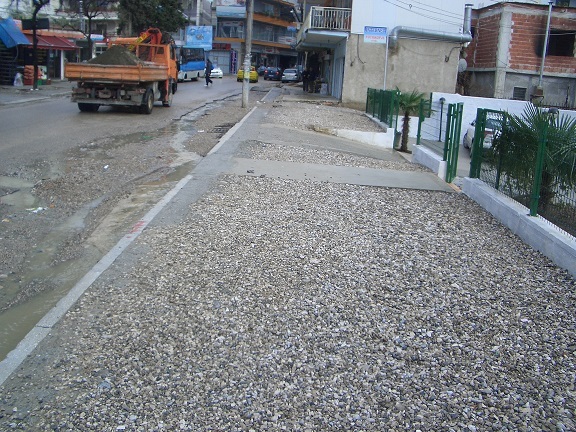 This post documents some of the efforts to improve the appearance of public spaces and building frontages in Tirana. Architecture and urban planning in the communism period in Eastern Europe are usually synonymous with ugly concrete buildings and soulless public spaces. The most horrendous of those buildings in Tirana is the Pyramid, designed by Enver Hoxha’s daughter to be a mausoleum for Enver Hoxha. 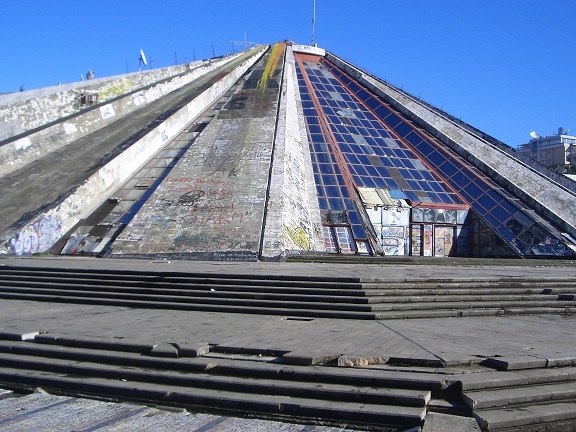 Despite arguments about the “importance of the ugliness“, the Pyramid is going to be demolished soon because it is derelict and anyway, pyramids are ill-fated for Albania. The period immediately after the end of the communist dictatorship was not a golden age of urban planning either, due to the “total lack of respect for public property” (Abitz 2006, p.67). 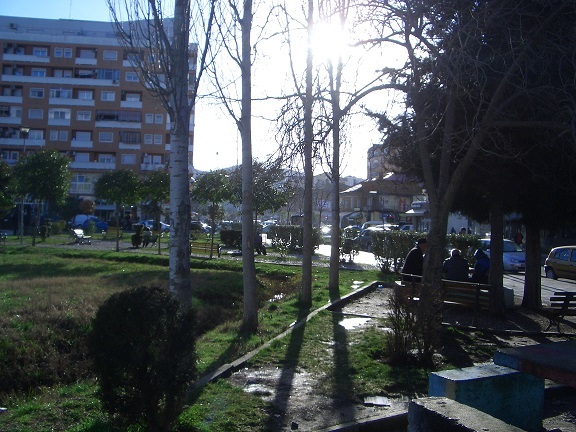 Migrants from rural districts occupied areas in the periphery, while in the centre the “original” residents extended their properties to the space between buildings. 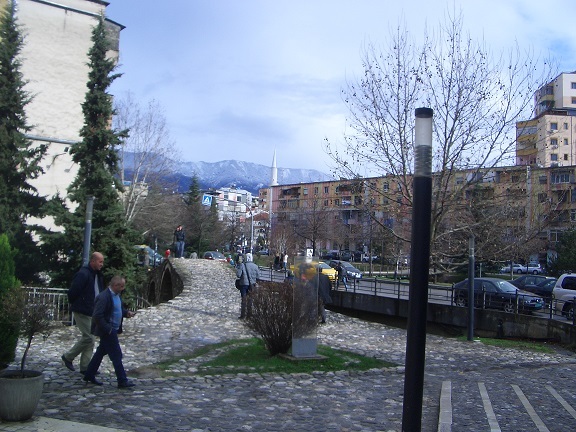 Public spaces were occupied by informal structures for business, most notoriously in Rinia Park, a “blatant and illegal horrific eyesore in the middle of the city” (Lucas 2002, p.238), and in the margins of the Lana, a small mountain stream crossing the city centre. This area has been cleaned up and landscaped. The picture of the left is from the Monuments for Late Capitalism website, where you can learn why it took 10 years before the last house at the Lana was demolished. The picture on the right is the Lana in 2015. There are still some places where the drab landscape and the decaying structures make walking an uncomfortable experience. The old apartment blocks from the communist era also tend to be in bad condition, although not many are as bad as the one below. The buildings look in better conditions than they really are because their frontages have bright colours, following a “painting campaign” led by Edi Rama, a painter who had had held more exhibitions than political offices by the time he became mayor in 2000 and is now the prime minister of Albania. 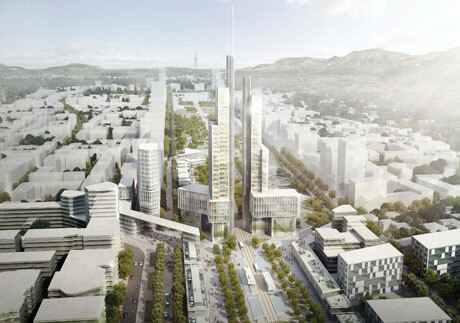 There are many projects for exciting new buildings in Tirana. But the construction frenzy has side effects. The new towers popping up everywhere are starting to spoil the visual landscape, as they replace older smaller buildings or occupy open spaces, even in the main square. Some say this square is in “catastrophic status” and should be changed, by building as many towers as possible in there. And by letting them be as tall as possible. See below (from here and here). 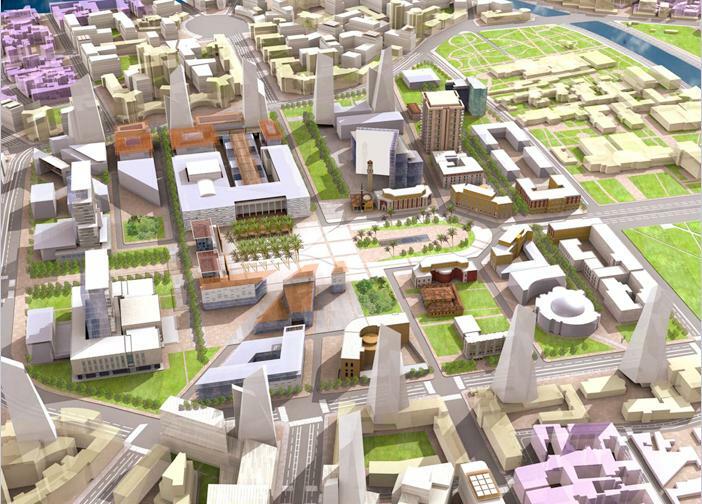 Let’s hope Tirana does not become another grand-scale pedestrian-unfriendly futuristic capital city like Brasilia, Astana, Naypyidaw, and Putrajaya. Abitz, J. 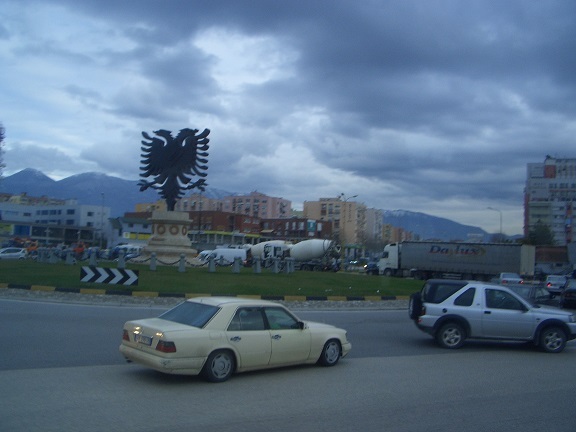 (2006) Post-socialist city development in Tirana. PhD dissertation, Roskilde University. 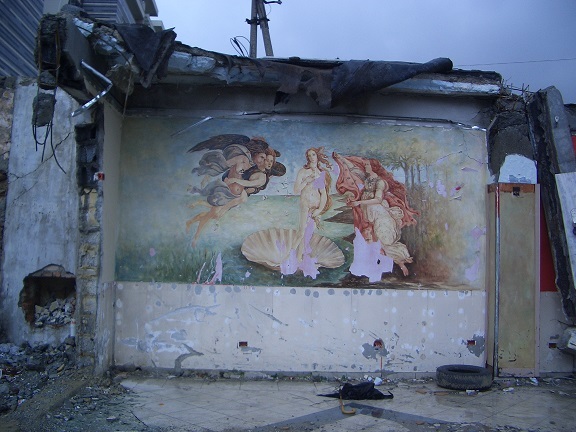 Lucas, P. (2002) Rumpalla: Rummaging Through Albania. XLibris, Philadelphia. Some cities have most of the spatial and social pre-conditions to be walkable. Tirana is one of them. 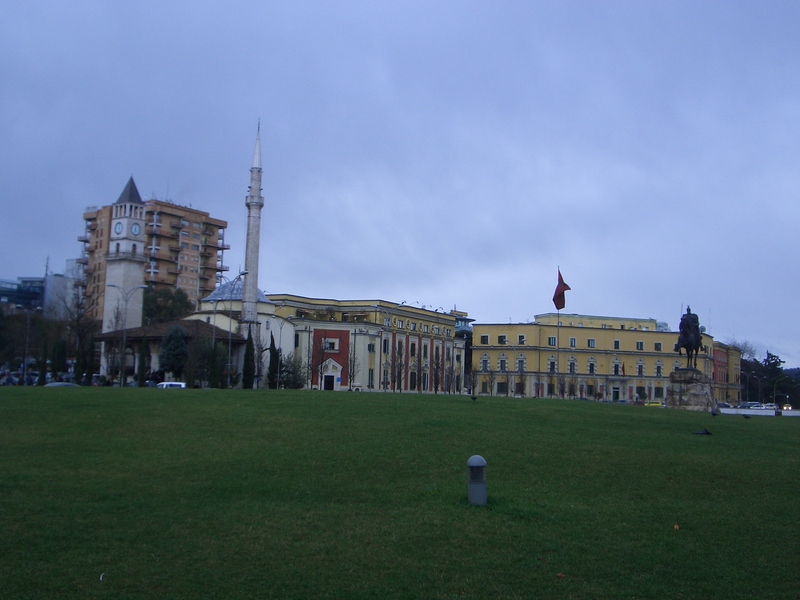 Tirana’s centre is densely populated and socio-economically diverse. The middle-cases have not moved to the suburbs due to the lack of infrastructure, and the poor have not been pushed out (yet), because they bought their former state-owned homes at a nominal cost (Pojani 2011, p.100). There is also a high density of businesses of all types (the most common of which seem to be betting shops…). The boulevards radiating from the central square have recently been lined with trees and had their pavements widened (sometimes at the expense of the demolition of homes). The main transversal boulevard will be extended and occupy the area of the dismantled railway line. Social aspects are important. A popular past time in Albania is the xhiro, an untranslatable word describing the activity of “walking around town to wind up the day, usually in the company of others”. The existence of many outdoor cafés facilitates the social role of the streets and promotes walking, because people vary their destinations every day, as the cafés are all unique, unlike the soul-destroying uniformity of those chain shops belonging to tax-dodging corporations. 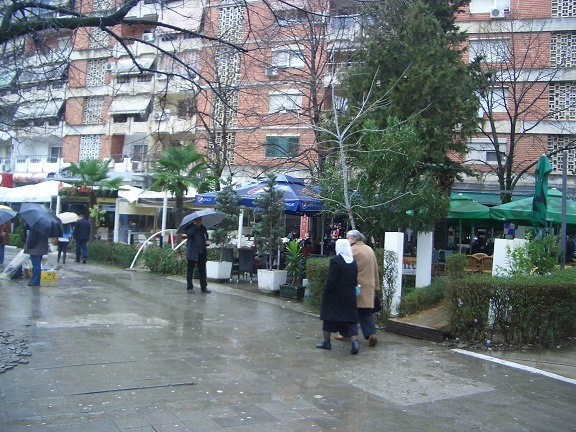 Small parks and courtyards were renovated and became places where people spend time. There are signs of increased segregation. The Bllok area, once exclusive to the political elite, is becoming off-limits to some people again, but now for economic reasons, given the prices of properties and services there (Kusiak 2011). Finally, walking is losing popularity. Pojani (2011, p.101-102) says that Tirana is becoming status-conscious and a sentiment is surfacing that “walking (other than recreational walking), cycling, and public transportation are lower-image modes.” In another paper she says that shopping centres are a lure for the public because of the “status associated with car-borne shopping in high-end stores” (Pojani 2010, p.842). Things are changing. Kusiak, J. (2011) Tyranny in Tirana: Political utopia and its urban afterlife., in J L Pollock and M Schwegmann (eds.) Espacios Ambivalentes. Ediciones Callejón, Viejo San Juan., pp.76-93. 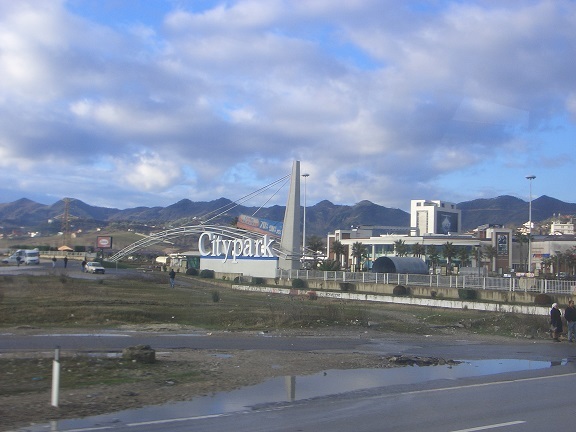 Pojani, D. (2010) Urban and suburban retail development in Albania’s capital after socialism. Land Use Policy 28(4), 836-845. Pojani, D. (2011) Mobility, equality and sustainability today in Tirana. Journal of Land Use, Mobility and Environment. 4(2), 99-109. The allocation of road space to different users was not a major problem in 20th century Tirana, because the main modes of transport used were “bicycles and horse-drawn carts, often with elaborately carved wooden cabins” (Carter 1986, p.277). As late as 1992, “cars behaved as bicycles, swerving to avoid the pedestrians” and bicycles used “whichever side of the road they liked” (De Waal 2005. p.38). 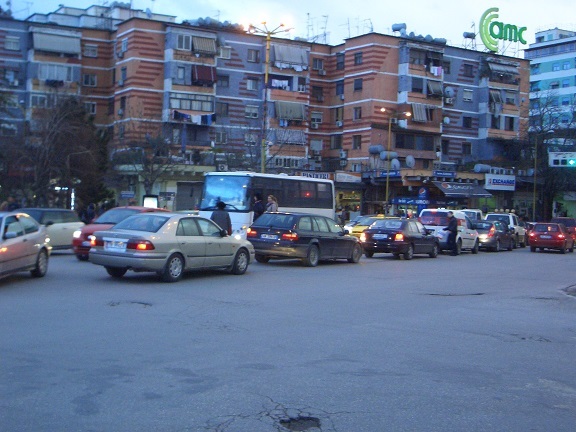 We are now in 2015 and there are 300,000 cars in Tirana, all of them asking for road space. Fortunately, the city has taken measures to ensure that these cars do not take up ALL the space available. Many of the boulevards that line the city now have a wide median strip which is off-limits to motorised traffic (Could this be a solution for London’s Seven Sisters Road?). Strangely, some of these median strips are also designated as off-limits to pedestrians, although this seems to be only in theory. And in practice, some motorised modes of transport such as motorbikes use the strips as well. 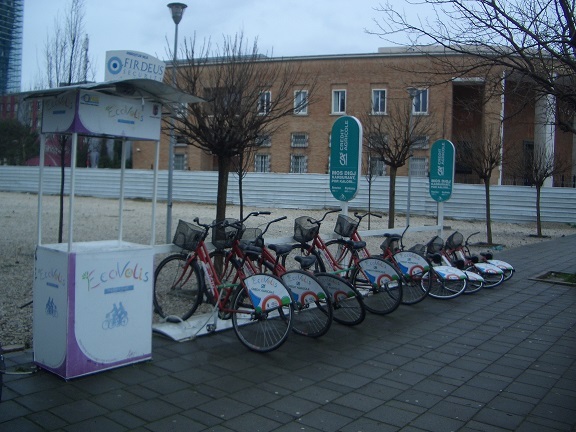 The Ecovolis bike share system, launched in 2011, and the new cycling lanes have also contributed to the promotion of cycling, and have even been used as a way to make peaceful statements that the city belongs to all. But I am not sure if the Ecovolis system is still operating, as the photo below suggests. 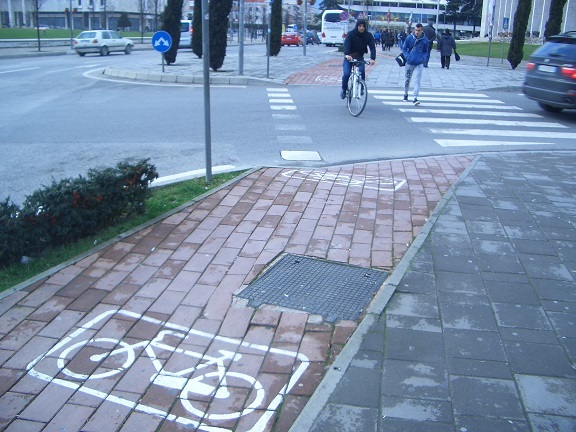 I am also not sure what will happen to the median strips and the cycling lanes after the boulevards are redesigned to accommodate the new mode of transport shown below (photo from Tirana Municipality). 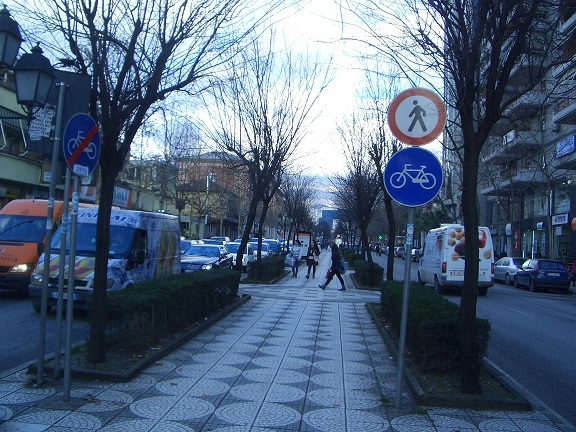 Often, the issue is not the allocation of space for users travelling along a road, but the design of the points where different spaces meet, for example, where pedestrian circulation is interrupted by side roads. Dropped kerbs are a solution that makes a real difference for the wellbeing of people with restricted mobility. Admittedly, these dropped kerbs seem to be much more frequent in the affluent Bllok neighbourhood than in other parts of Tirana, especially in the suburbs. The continuity of the pedestrian space is also interrupted by the space that private vehicles require when they are not circulating on the road. When we look at the surface quality and evenness of access to garages and pedestrian pavements in some places, it seems that priority has been given to the former. In other places, parked cars are major obstructions to the circulation of pedestrians. 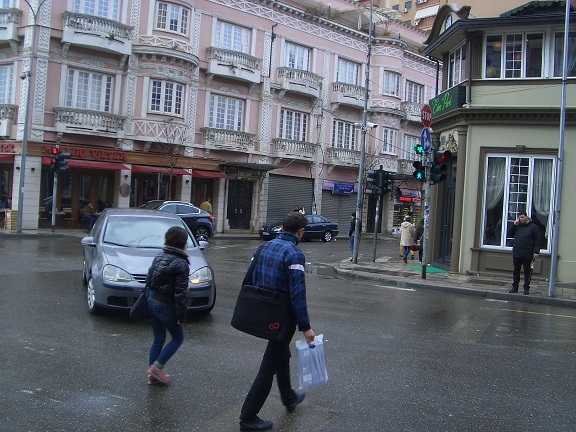 Another major problem arises at pedestrian crossings, due to the traffic regulations. Albania is one of those countries where vehicles are allowed to turn from all directions when it’s green for pedestrians, which is very, very, very dangerous. The city has many users, all with different needs. This post showed some of the issues planners face to accommodate those needs using the limited road space available. 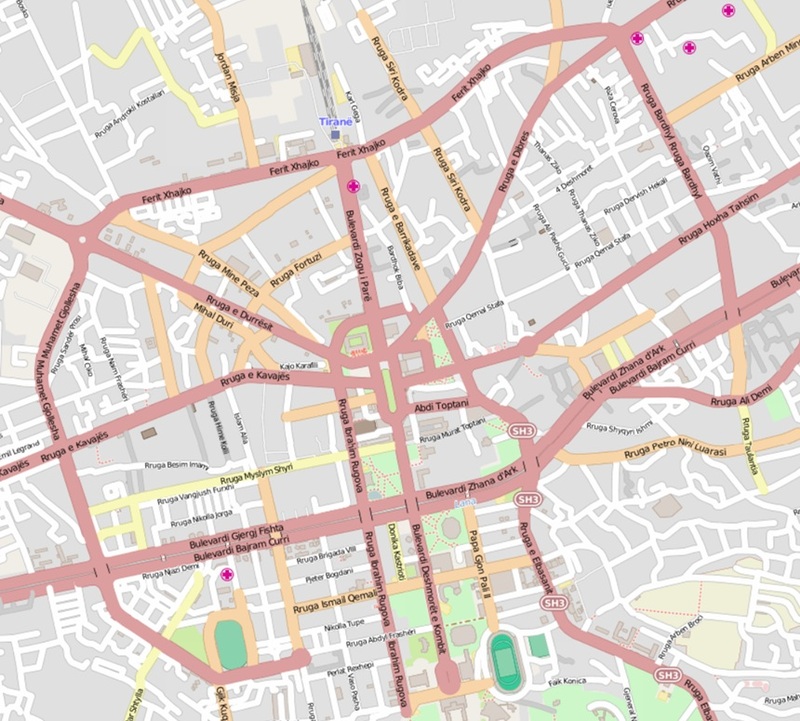 Carter, F W. (1986) Tirana (City Profile). Cities 3(4), 270-281. 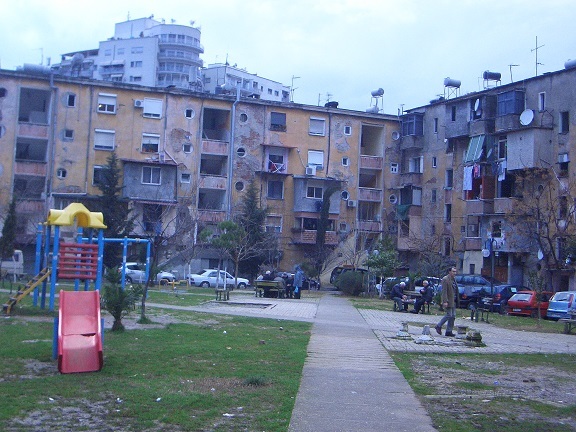 De Waal, C. (2005) Albania Today – A Portrait of Post-Communist Turbulence. I.B.Tauris, London. 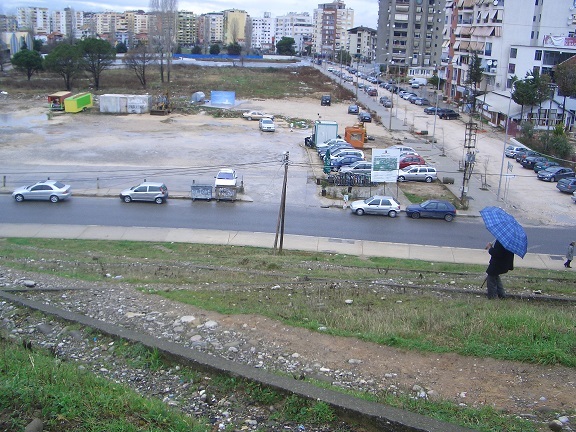 The last post described how cars have started to dominate the landscape of Tirana, and suggested that this may be the natural result of fast economic and urban growth. This and the next three posts will look at some aspects of the city life into more detail and find reasons to believe that growth is not necessarily accompanied by the deterioration of walkability and street liveability. Today’s post describes the city’s efforts to create pedestrian space. The most visible of these efforts was the restoration of Tanners’ bridge (which dates from the Ottoman period and used to cross the Lana stream before it was rerouted). The bridge is now the start of a pedestrian route that takes in other historical sites (a smaller-scale version of Athens’s Dionysiou Areopagitou street) and is a nice shortcut to avoid two busy roads. The effort to create safe and pleasant spaces exclusive to pedestrians is evident in the bollards and vases placed at the entrance of green spaces like Grand Park. Large and small squares around the city are also a refuge from the hustle and bustle of the city. The look and feel of the city has also changed as many dusty-muddy streets are now paved. 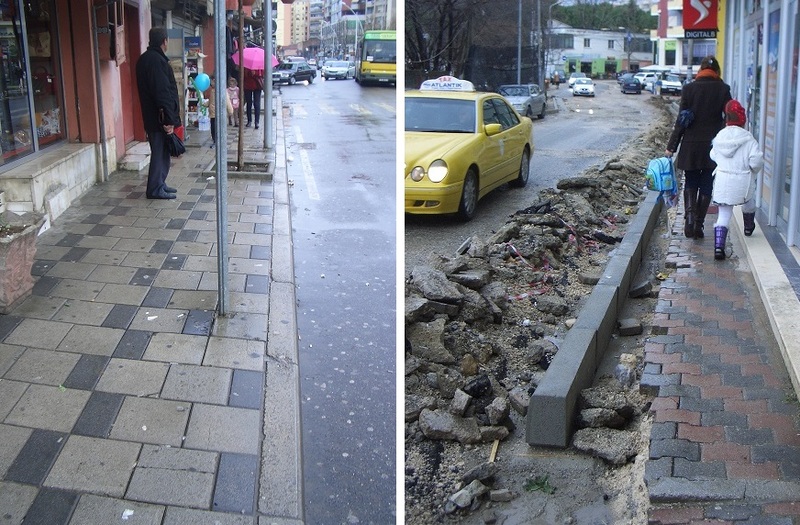 The Tirana Municipality webpage has several “before and after” pictures to show the changes. The creation of pedestrian space is not easy. In the summer of 2004 and 2005, car traffic was banned in some streets at some hours but the initiative was discontinued. One of the reasons was the dissatisfaction of local businesses with the “difficulty of access for the wealthier, car-owning customers” (Pojani, 2007). Pedestrian pavements also tend to have worse conditions than road carriageways. After all, the expenditure in road maintenance and repair was 78 times greater than the expenditure in pavement repairs. 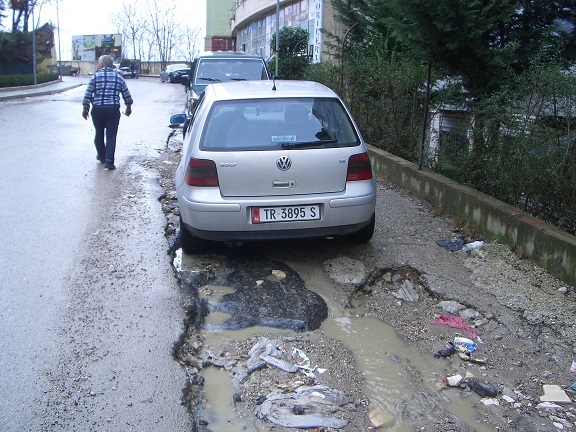 The internet has plenty of stories of travellers falling into holes in Tirana, but they do not really represent 2015 Tirana. However, city streets often fail to provide a safe environment for all. According to Pojani (2011, p.101-102), “more than 4,600 disabled people live in Tirana but they are rarely seen outdoors”. 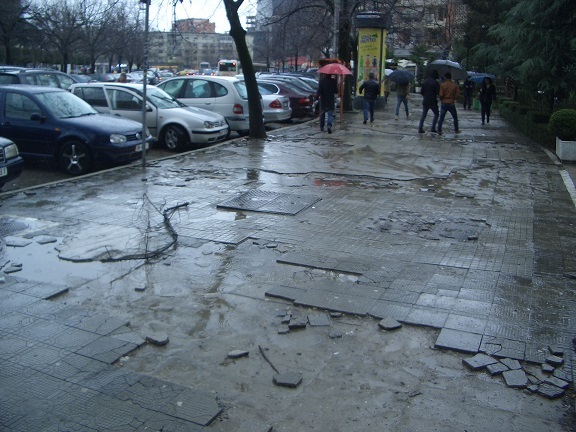 In fact, the conditions of some pavements are far from ideal, even in the areas around the main square. In other streets, the space available for walking is small, after deducting all the obstructions. And the situation becomes progressively worse as we approach the eastern fringes of the city, where new developments are starting to occupy the slopes of Dajti Mountain. 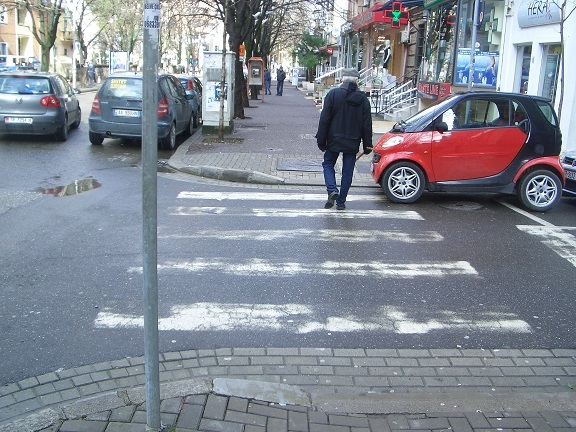 Despite these problems, the conditions for pedestrians in Tirana have improved dramatically since the 1990s. The next post will discuss how the improvement of pedestrian space fits into an overall strategy for the reallocation of city space among different types of users. 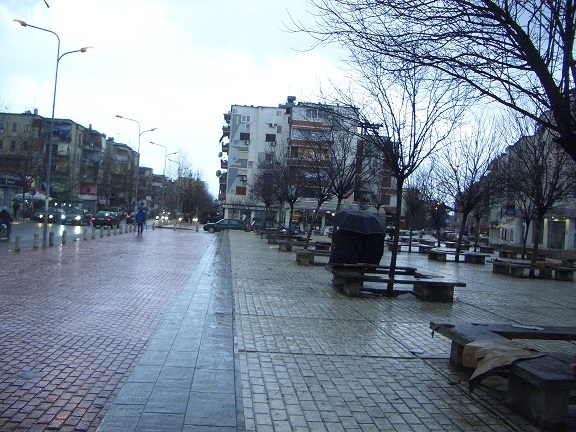 Pojani, D. (2007) Car-free areas in Tirana: fantasy or necessity? Albanian Journal of Natural and Technical Sciences 22(2), 27-42. It is said that in the 1970s there was only 600 cars in the whole of Albania. I suppose that all of them belonged to Enver Hoxha and entourage. 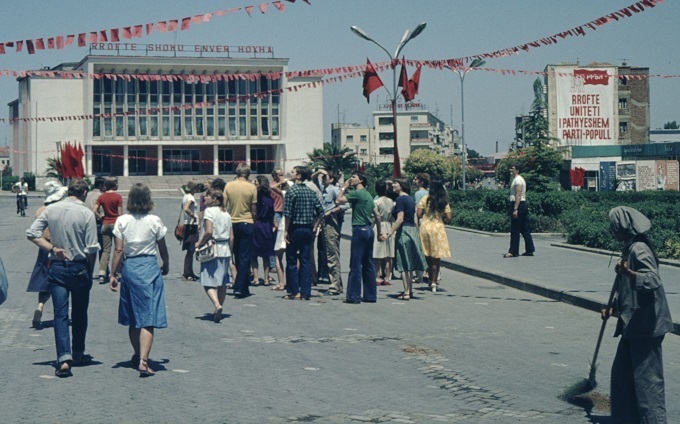 This is how the main square of Tirana (Skanderbeg square) looked like. 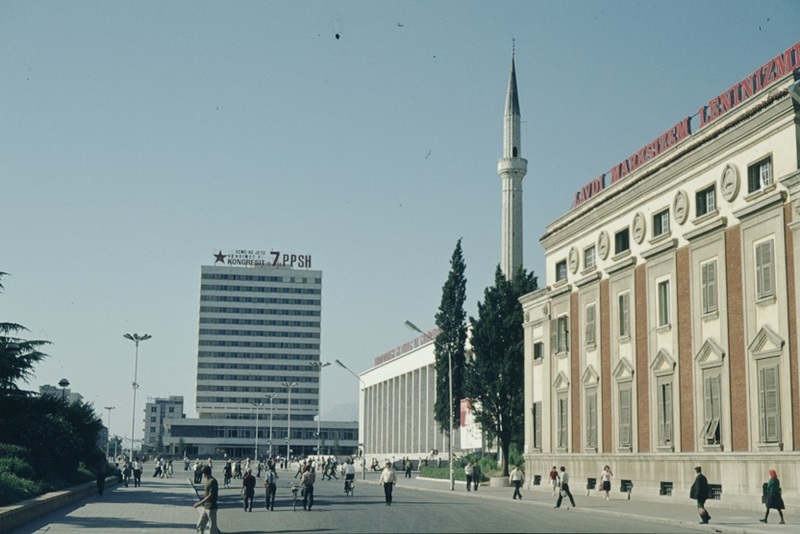 After the fall of the communist regime and the chaotic 1990s, the Albanian economy started to growth very fast. 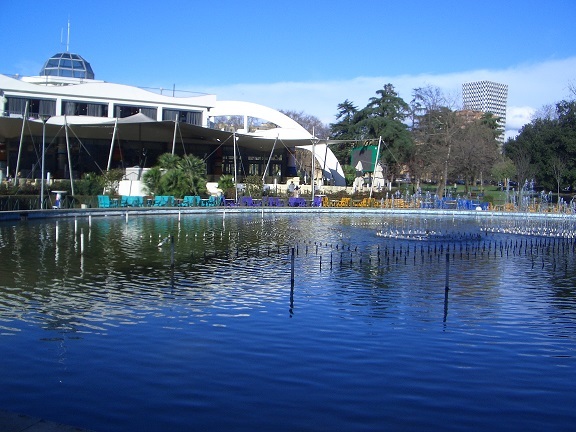 Tirana’s population doubled and its area expanded accordingly. The expected result is that the city is now full of cars. 300,000 of them. The issue is not that many people have now access to private vehicles, but that priority has been given to the improvement of the circulation of these vehicles, in detriment to other modes of transport. 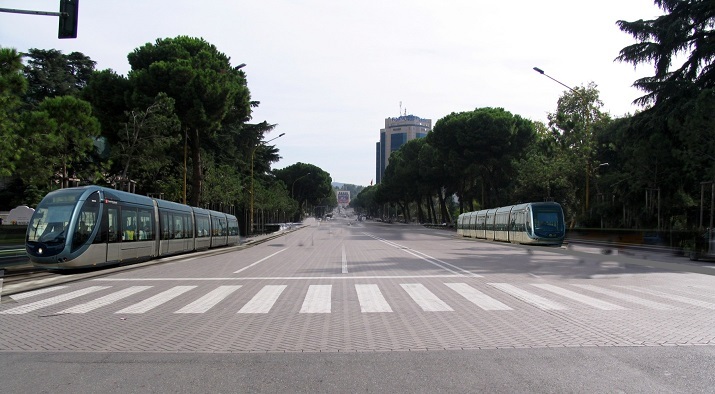 In 2015, Tirana must be the only European capital city with neither a train station (closed in September 2013) nor a bus station (long-distance buses depart from empty lots scattered across the city). 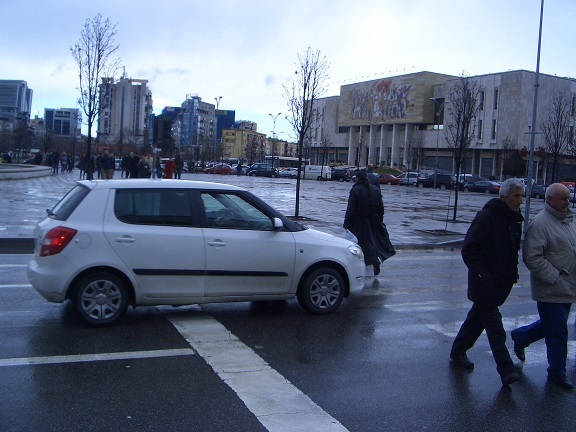 In other parts of central Tirana, the scenario is similar: big roads – many cars – hard life for pedestrians. However, not many people will try to walk or cycle across these roundabouts. In most cases, they experience them inside a car, taxi, bus or minibus. 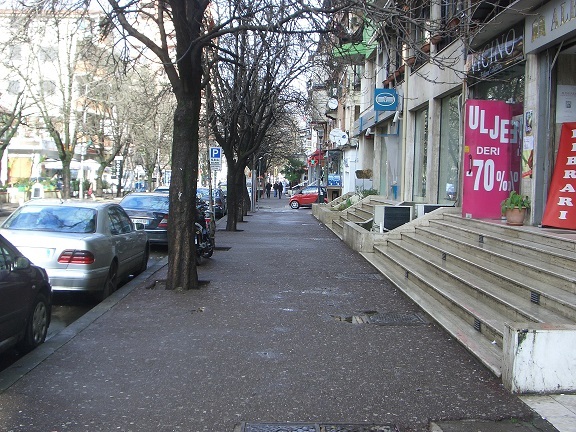 The biggest problems for pedestrians in Tirana are probably the minor roads, which have plenty of cars (using them as “rat runs”) and no pavements to seek refuge in. 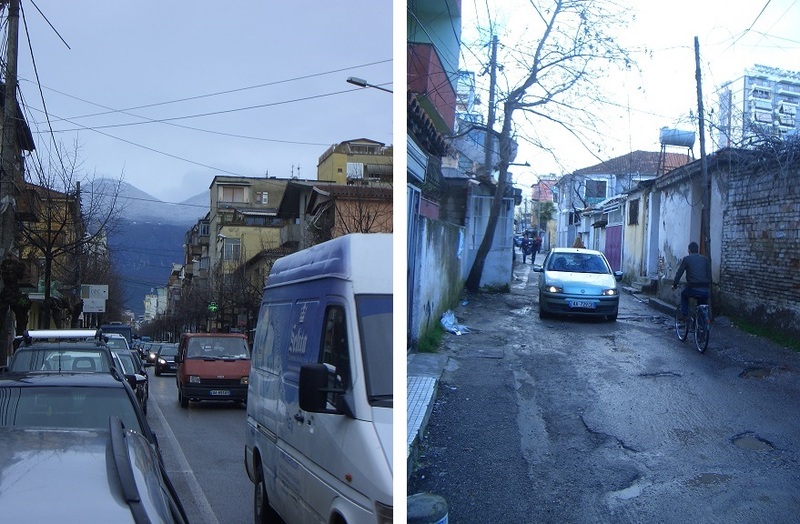 So at first sight Tirana looks like another example of a “lost opportunity”, a city where economic and urban growth leads to the dominance of the car, as it happened in plenty of other cities in the countries surrounding Albania. But the purpose of this blog is not to make an inventory of everything that is bad for pedestrians. That would be too easy, as problems can be identified in every city in the world. 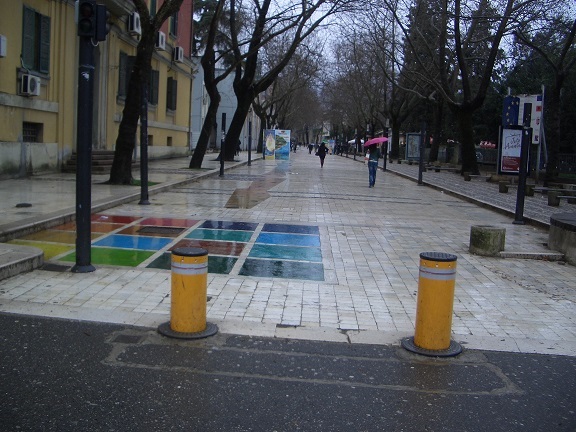 So the next four posts will describe the positive aspects of walking in Tirana, including recent developments related to the: a) creation of space exclusive for pedestrians; b) reallocation of road space among different types of user; c) social and urban factors maintaining street life in the city centre and sustaining the pressure for decentralizing facilities; and d) renovation of small public spaces and building frontages.